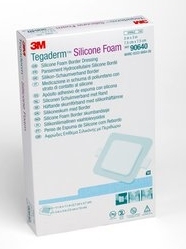 3M Tagaderm Silicone Foam Border Dressing is a soft, conformable and comfortable to wear dressing. Innovative fluid handling technology provides high absorbency with breathability to reduce the risk of maceration. It maintains a moist wound environment for optimal wound healing. Tagaderm Silicone Foam Dressings stay in place, yet remove easily, making it ideal for fragile skin. The foam does not swell thus decreasing the potential for disruption of healing tissue. The dressing does not adhere to the wound bed and periwound skin (undisturbed healing environment). The film backing prevents strikethrough and protects against external bacteria and viruses. In vitro testing shows that the transparent film provides a viral barrier from viruses 27 nm in diameter or larger while the dressing remains intact without leakage. Tagaderm Foam Dressings provide a water resistant seal while the dressing is intact which allows for showering. The adhesive film border is thin and has a low profile to minimize edge roll. They absorb/manage low to high levels of exudate, protects the periwound skin and maintains the moisture balance for optimal healing.